Got to love the fluff on KISS Blooming Camellias Lashes! This natural pattern style false lashes comes with the perfect fluff for added thickness for an accentuated flare. Camellias Lashes are striklying stunning multi-layered lashes that accentuate your natural eyelashes for a perfect blend of glam. Get ready for a closed-up from this simply pretty and strikingly stunning false eyelashes, Blooming Lash Collection by KISS are delicately hand-crafted to deliver flourishing layers of lashes on a single lash band for ultra-glamourous and naturally voluminous look. 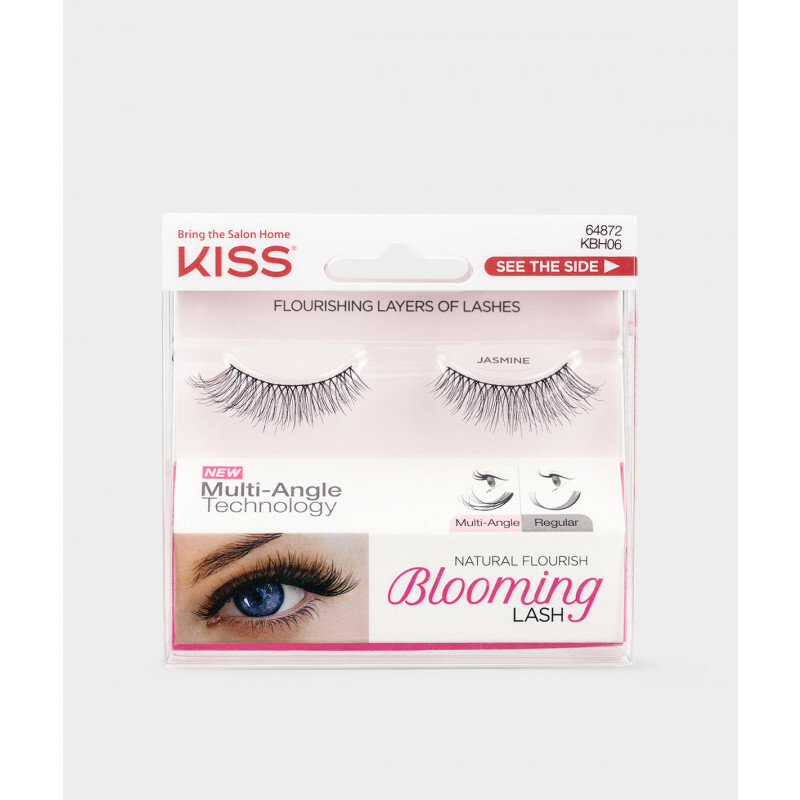 KISS Blooming Daisy Lashes are stunning natural yet noticeable multi-layered lash style that accentuate and volumize your natural lashes with a little boldness for a can't go wrong glamorous look! Get ready for a closed-up from this simply pretty and strikingly stunning false eyelashes, Blooming Lash Collection by KISS are delicately hand-crafted to deliver flourishing layers of lashes on a single lash band for ultra-glamourous and naturally voluminous look. KISS Blooming Jasmine Lashes are stunning natural yet noticeable multi-layered lash style that accentuate and volumize your natural lashes with a little boldness for a can't go wrong glamorous look! Get ready for a closed-up from this simply pretty and strikingly stunning false eyelashes, Blooming Lash Collection by KISS are delicately hand-crafted to deliver flourishing layers of lashes on a single lash band for ultra-glamourous and naturally voluminous look. KISS Blooming Lily Lashes are a fun and seductive criss-cross design false eyelashes with stunning multiple layers of overlap lashes to accentuate your natural eyelashes for a perfect feathery look. This lashes are short at the ends and longest at the center to make your eyes look captivating for an inviting look. Get ready for a closed-up from this simply pretty and strikingly stunning false eyelashes, Blooming Lash Collection by KISS are delicately hand-crafted to deliver flourishing layers of lashes on a single lash band for ultra-glamourous and naturally voluminous look. 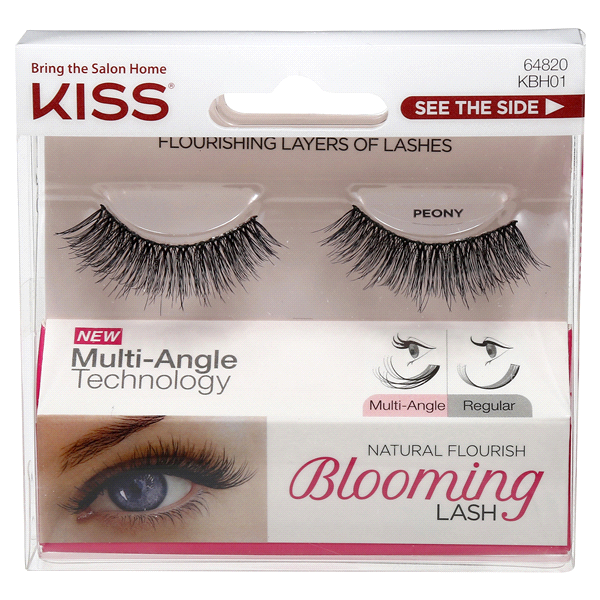 KISS Blooming Peony Lashes have multi-layered of lashes to extend from lash band instead of traditional one angle flat strip eyelashes. These stunning sultry multi-layered lashes accentuate your natural eyelashes with variety of angles and lengths for a perfect blend of glam. Get ready for a closed-up from this simply pretty and strikingly stunning false eyelashes, Blooming Lash Collection by KISS are delicately hand-crafted to deliver flourishing layers of lashes on a single lash band for ultra-glamourous and naturally voluminous look. 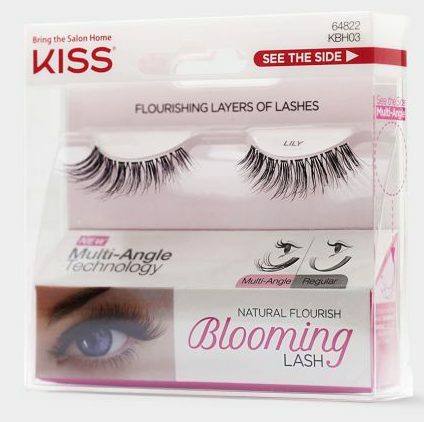 KISS Blooming Tulip Lashes offer tightly woven bundles of lashes for most natural look designed for everyday wear. These beautiful stunning multi-layered lashes have sparsely distributed angles of lashes for a flourishing fringe look! Get ready for a closed-up from this simply pretty and strikingly stunning false eyelashes, Blooming Lash Collection by KISS are delicately hand-crafted to deliver flourishing layers of lashes on a single lash band for ultra-glamourous and naturally voluminous look. Take your look from everyday to strikingly stunning with our Blooming Lash Collection. 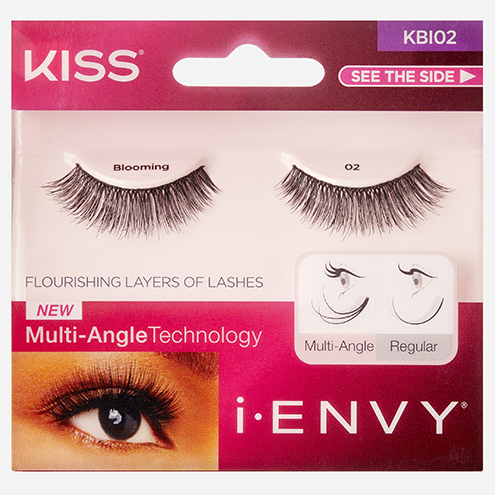 KISS i-Envy Blooming 03 Black Strip Eyelashes (KBI03) has multi-angle technology delivers layers of lashes on a single lash band so you can accentuate your eyes with natural-looking lashes that blend beautifully with your own. Take your look from everyday to strikingly stunning with our Blooming Lash Collection. KISS i-Envy Blooming 04 Black Strip Eyelashes (KBI04) has multi-angle technology delivers layers of lashes on a single lash band so you can accentuate your eyes with natural-looking lashes that blend beautifully with your own. Take your look from everyday to strikingly stunning with our Blooming Lash Collection. KISS i-Envy Blooming 05 Black Strip Eyelashes (KBI05) has multi-angle technology delivers layers of lashes on a single lash band so you can accentuate your eyes with natural-looking lashes that blend beautifully with your own. Take your look from everyday to strikingly stunning with our Blooming Lash Collection. KISS i-Envy Blooming 06 Black Strip Eyelashes (KBI06) has multi-angle technology delivers layers of lashes on a single lash band so you can accentuate your eyes with natural-looking lashes that blend beautifully with your own.